The room has many flaws: the rough condition of the walls and floors, the doors opening in front of the windows, the radiators, the large number of windows which take up valuable wall space, the large ugly ceiling vent, the ultra-low ceiling, the lack of general lighting throughout, and the placement of the only large wall spaces at the sides and rear as you enter. I definitely have my work cut out for me! Welcome to one of my first posts about the 2016 Bucks County Designer House bedroom I’m designing. 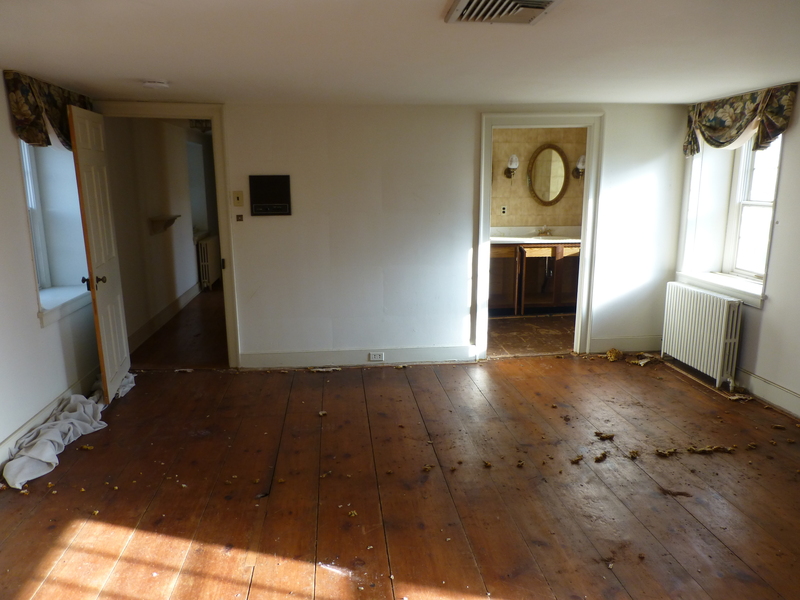 I want to share with you some of the before images of this space, and tell you about my process as I’m designing this room (or any room for that matter). A designer’s first impression of a room is so valuable. I always try to pay attention to where my eye is drawn and what seems to be most important when I’m entering a space for the first time. That way, I can choose to enhance that focal point, or draw attention away from it and create a different focal point. Isn’t it great that each of us has that power? We can control where our eyes, and those of our visitors, will travel and rest. 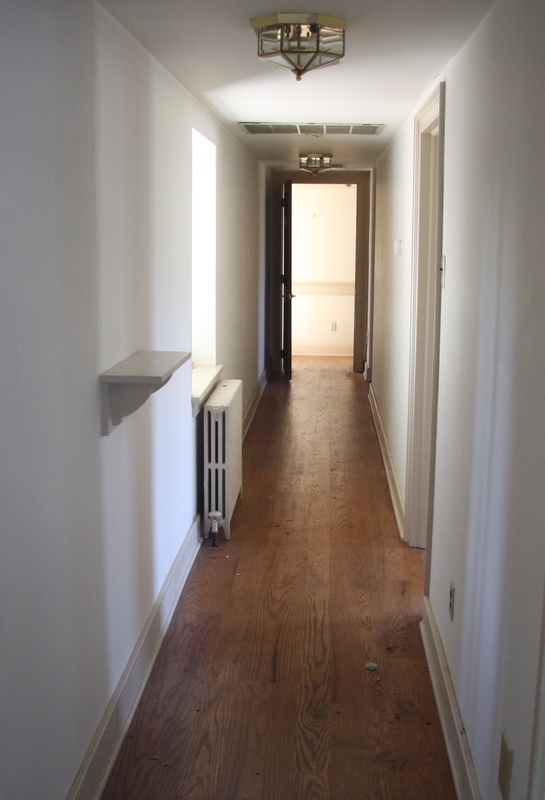 My room at the 2016 Bucks County Designer House is at the end of this long hallway, which will act as an art gallery. Here’s the BEFORE view upon entering my bedroom at the 2016 Bucks County Designer House. As you can see, the room is in quite a rough state! The wall opposite the entrance has an attic door (on the left), a cedar closet under the stair, then a small L-shaped nook of wall space and another shallow closet on the right. Notice the bulky ceiling vent, centered on the ceiling of the space. As you continue rotating to the left, the bathroom door (at the right) and entry door from the hallway (on the left) come into view. The large dark brown thing on the wall is an old intercom system that runs throughout the house. Happily, it will be removed by the homeowner prior to the showhouse. And finally, the wall immediately inside the entrance door (shown hanging open at right). This wall also has two windows and a nice wide blank space in between. It mirrors the opposite wall almost exactly. You may have noticed that the doors throughout the space open right in front of the windows, making the design even more challenging. 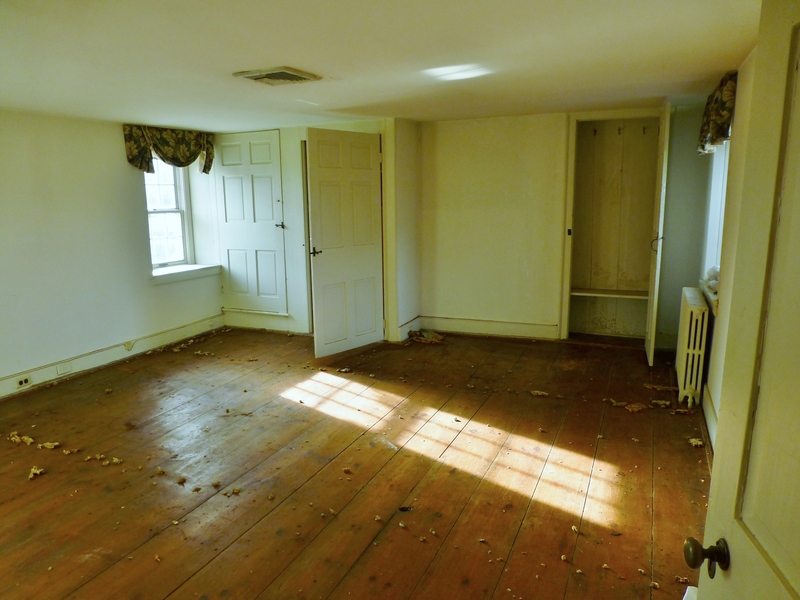 I’m pretty sure you’ve probably already noticed the antique pine flooring throughout the bedroom. My space is in the historic portion of the 2016 Bucks County Designer House. The original farmhouse dates to 1860. Obviously the floors were previously carpeted, so there are many staples and bits of foam padding everywhere, along with the old tacking strips around the perimeter. 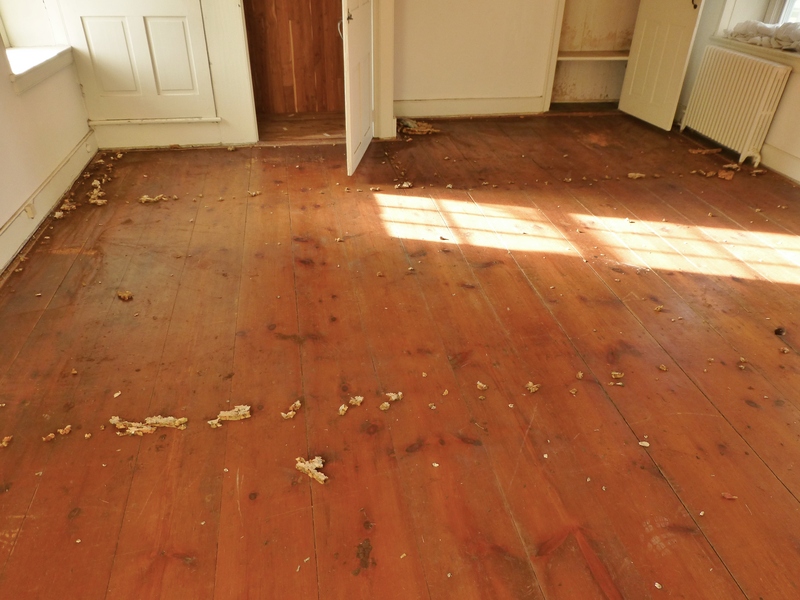 Once these remnants of the previous floor are removed and the wood is cleaned and polished, this floor should be very pretty, albeit a bit rustic. Don’t you just love the super wide planks and the rich amber color? 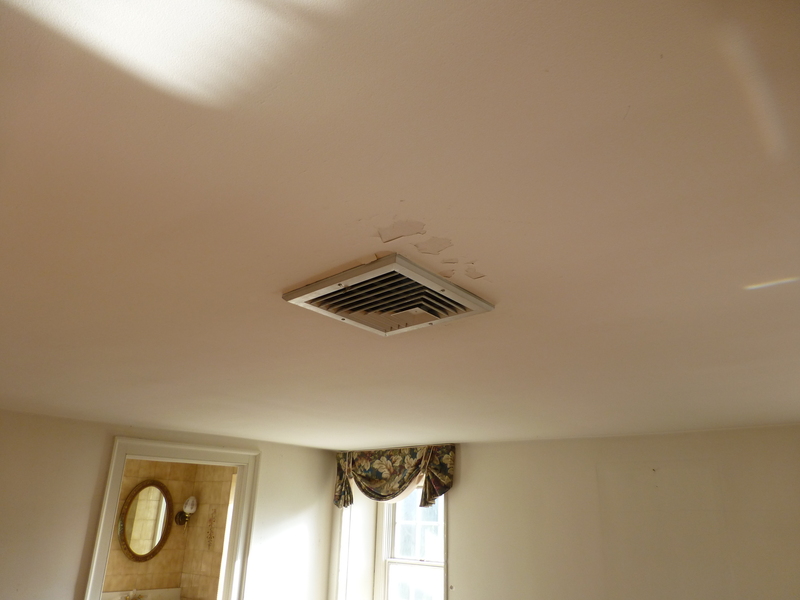 And then there’s this lovely HVAC vent, right in the middle of the ceiling in my space at the Bucks County Designer House. This is yet another challenge I’ll face when designing the space, especially since the ceilings are very low (approximately 80″ high–less than 7 feet!). So, what would you do with such a challenging space? The room has many flaws: the rough condition of the walls and floors, the doors opening in front of the windows, the radiators, the large number of windows which take up valuable wall space, the large ugly ceiling vent, the ultra-low ceiling, the lack of general lighting throughout, and the placement of the only large wall spaces at the sides and rear as you enter. I definitely have my work cut out for me! 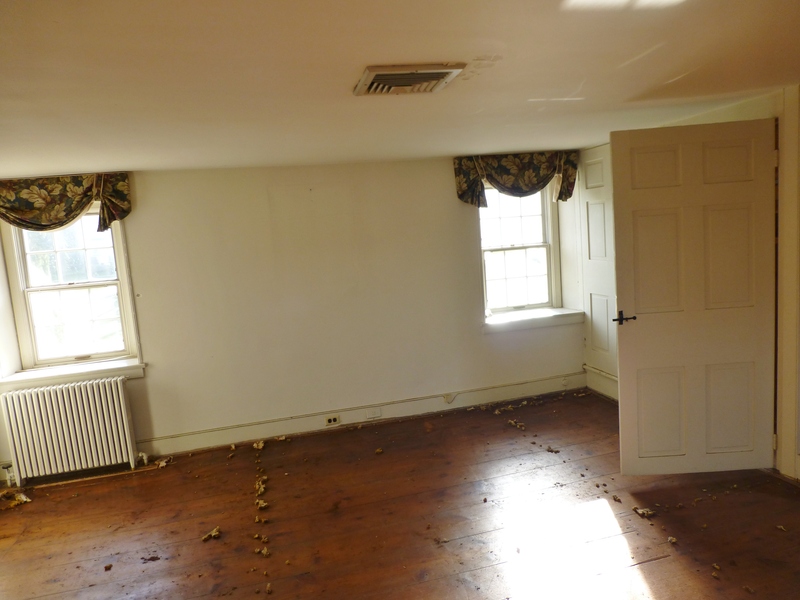 I will admit, the bedroom does have some nice qualities too: The natural light is very good, thanks to those 4 windows which do have nice deep windowsills, the antique pine floor has lovely wide planks, and the overall space is moderately spacious at approximately 18 1/2 x 15 feet. I’ve decided to decorate the bedroom for a young lady, and I’m very excited to have partnered with some of my wonderful suppliers. My friends at Stenella Antiques will be providing all the fine furniture for the space. Stout Textiles will be providing sumptuous fabrics and trims from their upcoming (not even released yet) line of wholesale luxury goods. Grace Irene Window Fashions will be providing all the custom drapery and bedding labor. My friend Michael Howard, from The Perfect Hangup will be doing all the prep work and painting in the bedroom with paint supplies provided by Benjamin Moore. And I’ve also been working with Limitless Walls on a special project for the small nook on the wall opposite the entryway. I’ve promised a separate blog post for each of them, so I can show you all the amazing products and services they provide. Can you believe how many amazing sponsors are providing their wonderful products and services in this space? I’m so honored and thrilled that some of my favorite designer resources have stepped up and agreed to participate in this fabulous young lady’s bedroom! It’s going to be phenomenal and I can’t wait to share all the details with you over the next couple of months. 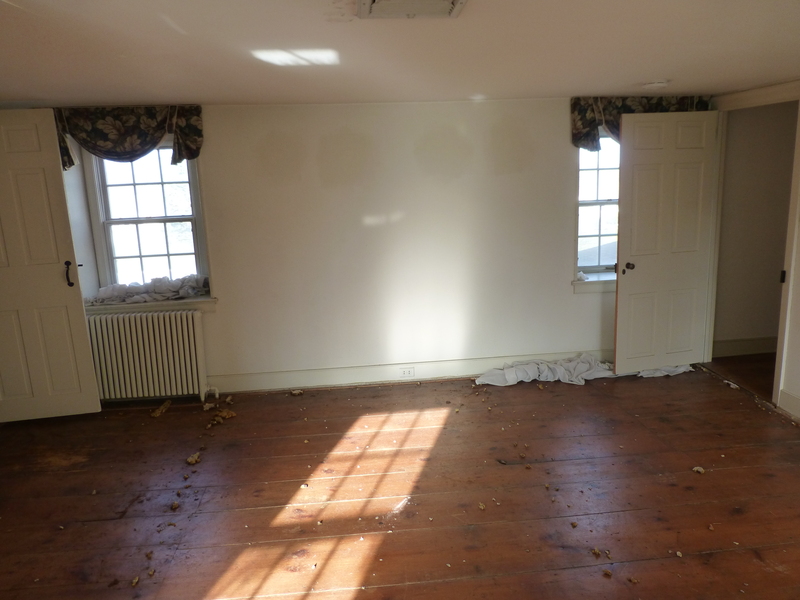 Next time I want to show you the before images of the adjacent bathroom, which I will also be styling for the 2016 Bucks County Designer House and Gardens. Then we’ll start discussing the my ideas for the floor plan, paint colors, fabrics, etc. There’s so much to do!! This entry was posted in 2016 Bucks County Designer House, Bedroom, Before, Designer House, Robinson Interiors and tagged Bucks County Designer House, Ceiling Vent, Grace Irene Window Fashions, Interior Design, Kristine Robinson, Limitless Walls, Low Ceilings, Pine Floors, Renovation, Stenella Antiques, Stout Textiles, The Perfect Hangup. Bookmark the permalink.